Mobile Quiz is a highly customizable quiz game which is mainly used for promotion events. 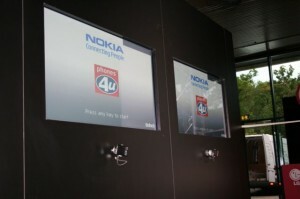 It is usually played on a Nokia N95 which is connected via video out to a big screen. See images for the setup. During the game a specified number of questions out of a predefined question pool are shown to the player. She has to answer them as quickly as possible by choosing one of the answers displayed on the softkeys. To pressure the player the quiz has to be completed in a specified time. 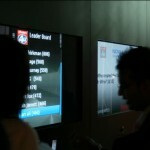 Players are encouraged to play multiple times by a leader board that shows the best players including their scores. Mobile Quiz has been produced for a client in Great Britain and up to now adopted for various events. If you want your own version feel free to contact me.